If we compare the man's face to Raphael's (far left), the beard, moustache and shape of the eyebrows are identical. The man, then, clearly represents Raphael even if it is not Raphael. 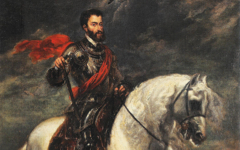 However, no-one has noted that he also resembles Titian. 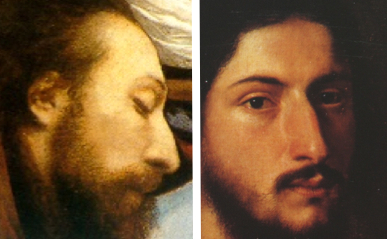 If the gentleman's head is placed next to Titian's presumed self-portrait as John the Baptist in 1515 (far left), one of very few early self-portraits, there appears to be strong similarity to Titian as well, even when compared to a profile. How does this all make sense? The portrait is dated around 1520, the year of Raphael's untimely death. Thus, more than likely, this portrait is Titian's memorial tribute to a great master who even though he competed against him in life now honors him in death. 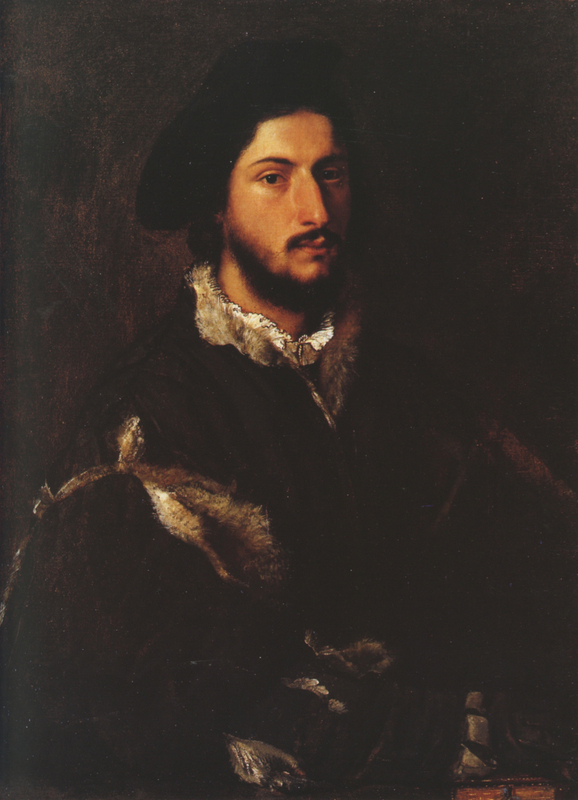 Titian, identifying with Raphael, has painted (or more properly, imagined) a portrait of himself in the style and pose that Raphael himself used "in portraying the intellectuals of his day." The sitter, assuming there was one, is hardly present in this mirror-reflection (or mental image) of "the artist". This article was first published in March 2012. Original Publication Date on EPPH: 16 Oct 2012. © Simon Abrahams. Articles on this site are the copyright of Simon Abrahams. To use copyrighted material in print or other media for purposes beyond 'fair use', you must obtain permission from the copyright owner. Websites may link to this page without permission (please do) but may not reproduce the material on their own site without crediting Simon Abrahams and EPPH.